On Friday the ribbon-cutting ceremony took place in Orlando. Due to naming rights negotiations ongoing, for now it’s simply Orlando City Stadium. Yesterday fans were able to visit the building themselves, but not for a game yet, only for a community/tour event. Still, over 10,000 came to enjoy a first glance at their new stadium. Official opening game is coming in just one week (March 5), when City will face City, the one from New York. If someone waited with buying their ticket, it’s too late. The game is sold out entirely and so is the hit clash against L.A. Galaxy in mid-April! To think that they broke ground with plans of having 6,000 seats less at the stadium. That’s right, when construction began in late 2014 the stands were planned for 19,000 people (early announcement even spoke of 18,000). But with growing interest it was decided that the building should be greater, so corners and south end were filled, expanding it to current capacity of 25,500. And even that will likely prove too small for all interested fans to get inside. Just for reference, their first season in MLS, played entirely at Citrus Bowl (Camping World Stadium), enjoyed the country’s second largest soccer attendance of 31,324 people per game, almost 6,000 more than they can hold now. That explains why investors didn’t back down when taxpayer money wasn’t granted for the project. they’ve spent $155 million on this stadium (compared to $110 million initially planned, before expansion was approved). Now we’re going to praise Orlando City, because they’re doing something English fans have been campaigning for. 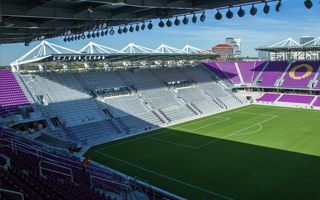 The stadium offers a 3,800-capacity terrace. Equipped with safe standing, it’s steeper than the rest of the stadium and located under 5 meters from the field, even less than UEFA or FIFA recommend. Largely covered, the stand is the only part of the stadium that should get quite hot regularly. While you cannot smoke a single cigarette throughout the facility, here controlled use of smoke will be allowed. Organised groups will also be free to bring flags and instruments inside. Of course implementation of these policies will be a thing to watch closely, but the 2017 season is looking very well for Orlando City supporters!